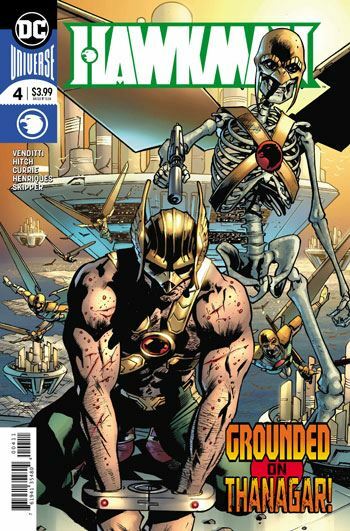 Carter Hall visits his past self on Thanagar and sees Katar Hol, the Hawkman of Thanagar. They fight. Who will win? I know this series is everyone’s darling but is not mine. A situation that was conflicted and confusing is just becoming a greater mess. Instead of trying to make sense of Hawkman’s continuity. Robert Venditti plays with the confusing continuity and makes it worse by suggesting that Carter Hall and Katar Hol are the same person even though the two of them have existed concurrently in the DC universe. It is poetic to make them the same person and to extend the gratuity to Shiera Hall and Shayera Thal, however, it’s a gimmick that will not help the characters in the long run. The comic continues to be an adventure with no real conclusions. The Thanagarians look like the classic Hawkworld series from the 1990s. It’s great. That’s the problem. 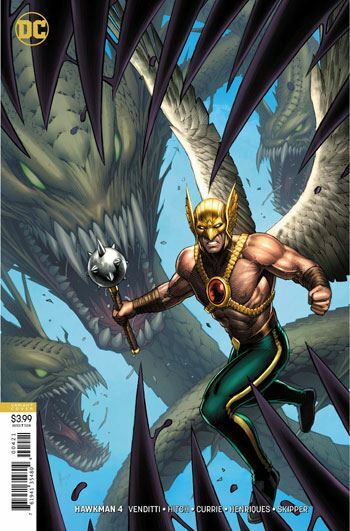 The series looks right and just like Hawkman and uses the visual language of Hawkman although the helmet of the current Hawkman annoys me. The inking of the series has improved a bit and makes Bryan Hitch’s loose pencils stronger.